Are you planning your trip to the City of Angels? Let Los Angeles Charter Bus Company streamline your transportation with a private bus rental! With the click of a button, browse through various bus options ranging from 18-passenger minibuses, to 20-, 25- and 56-passenger charter bus rentals. Our network includes some of the best transportation professionals in the industry who know the ins and outs of California, from start to finish. Contact a reservation specialist today at 310-667-6197 and get assistance in planning your trip to the West Coast! Los Angeles Charter Bus Company can pair you with the perfect bus for every occasion. From family trips to school and friend outings, we have the right bus for any group event. Our reservation specialists follow strict rules to enable an efficient yet affordable booking process. First, we require details such as group size, group type, and the purpose of the event. If you are traveling with a large crowd, we recommend the spacious 56-passenger MCI coach. On the other hand, if your group amounts to 10-15 people, the 18-passenger minibus is the best fit. Following the group size, if your group type consists primarily of elders over youth or vice versa, your specialist will pair you with a bus that caters to each age group’s needs. Premium amenities such as spacious legroom and reclining seats may appeal to a slightly older crowd, as opposed to free WiFi and AV entertainment that will be attractive to the younger generation. Figuring out the purpose of the event is also important since our bus rental service can offer additional services to simplify transportation for each group. For instance, when it comes to corporate parties, your driver can pick up and drop off each employee at the hotel and their destination. In the case of school trips, your driver can pick up and drop off all students at their campus or at their chosen location. Even if your trip plans haven’t been finalized, we can provide you with a free, no-obligation quote based on the distance you will travel and which amenities you prefer on your private bus and additional parking or toll costs. The team at Los Angeles Charter Bus Company understands that it is expensive to travel in and around this beautiful city, which is why we provide your group with the best pricing. We believe that bus rides should be fun and affordable, not overpriced and uncomfortable. A stunning beachfront city by the coast, Hermosa Beach is the perfect location for an impromptu family trip. Book a customized bus rental to accommodate your immediate and extended family members. 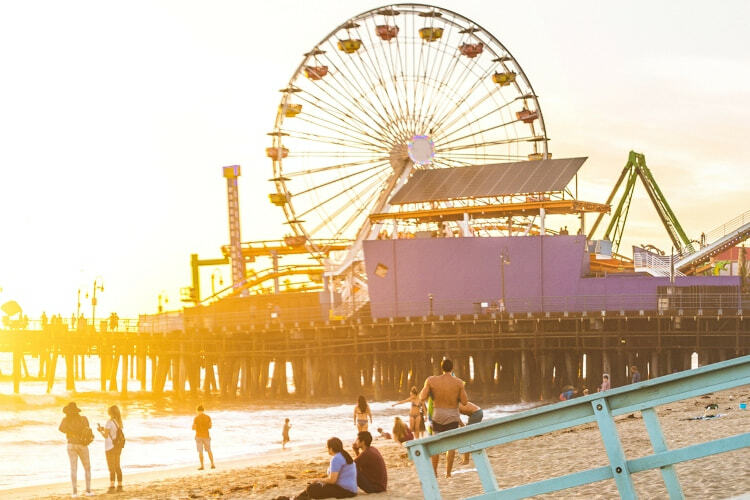 Your driver can drop you off at Hermosa Beach Pier, a top tourist destination for great food and drinks, or hitch a ride to the Seaside Lagoon for a day filled with snacks and sailing. Your bus rental will have ample space for you to store all your souvenirs, seashells and picnic baskets, so that you will not need to lug around heavy bags on your family vacation. Avoid spending money on seaside lockers and invest in group transportation for your day at the beach. In the heart of Beverly Hills, Rodeo Drive is at the intersection of luxury, fashion, and entertainment. Plan a day trip with your gals and shop at some of the best brands in the world! From Chanel to Bottega Veneta, your personalized bus rental can take you wherever you want to go. The electrical outlets on the bus will make sure all your phones are charged, while the large storage bins on board can store your collective haul at the end of the day. Don’t spend exorbitant amounts on parking fees-- book an affordable bus rental and save that money for the biggest shopping spree of your life! In a city as spread out as Los Angeles, there is so much to see and do. Contact our reservation specialists at 310-667-6197 and plan your itinerary filled to the brim with all the hottest attractions and restaurants! No matter your choice, Los Angeles Charter Bus Company will take you wherever you need to go. Apart from this sunny city, our charter bus rental service caters to other locations such as Bakersfield, Long Beach and San Luis Obispo. Book your trip today for the adventure of a lifetime!